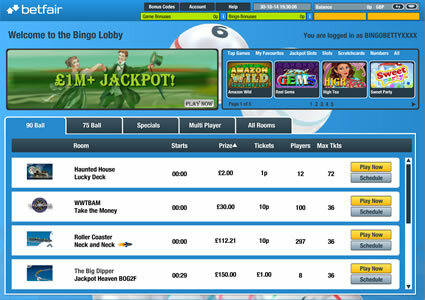 After years of rumours, Betfair Bingo finally opened their doors in March 2013. The site is just a small part of the much larger Betfair operation which encompasses many other forms of online gambling including Sportsbook, Casino, Poker and Vegas to name but a few. When you register you will gain full access to all of the sites involved. Once you have created your account you will receive a gaming wallet for each one, and you can transfer your funds between them as and when you like. 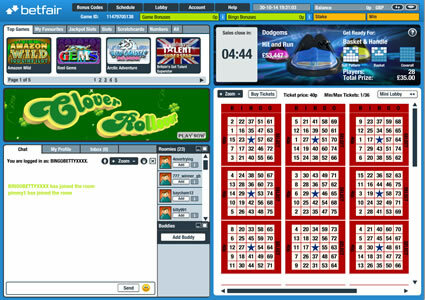 The bingo pages are bright and welcoming with a white and blue colour scheme, which makes a real change from the pinks and pastel colours that bingo sites usually rely on. 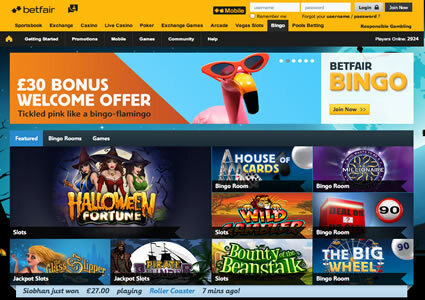 The homepage of Betfair Bingo is made up of a selection of banners which advertise their latest games and promotions, and to be honest with you, because they have used different transitional effects to switch between them, they can become very irritating if you watch them for too long. Betfair Bingo is powered by the Virtue Fusion software, and the first time you enter the lobby you will have to come up with an alias. This needs to be different to your username and different to any name you may have used on any of the other sites on the network. This is the name you will be known by in the bingo rooms, and you can set up a profile to let people know a bit more about yourself. Once you have done this, you can also add roomies to a friends list, and this enables you to send them private messages as well as being able to talk to them in the chat room. There are loads of games to choose from including 75 ball bingo, 90 ball bingo, slots, scratchcards, number games and multi-player games such as Clover Countdown that combine the excitement of slots with the chance to compete against other players. The bingo rooms use the networks standard layout, but at least they are coloured to match the rest of the site. As you would expect from an established software platform, everything is well designed with all of the important features just where you would expect them to be. 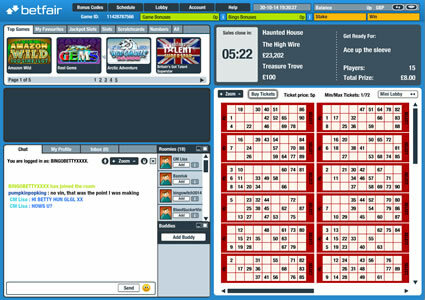 The left hand side of the screen is dedicated to the chat room where you can enjoy a bit of banter with your buddies and take part in chat games to win a bit a bit of extra bonus money. Just above this you will find a selection of mini games and you can even build up a list of your favourites so you don’t have to go searching for them. These games open up above the chat rooms so do not interfere with your bingo fun, but the only downside is this makes the chat room smaller so you don’t have as long to read everything. There are a decent number of promotions on the go at Betfair Bingo with a schedule of regular offers combined with monthly specials. The majority of these games are focussed on either saving you money such as BOGOF bingo, or rewarding you with bigger prizes pots, for example their daily Bingo Linx games. It’s not a bad line-up of promotions and they beat those offered by some of the other networks out there, but sadly they cannot compete with standalone sites such as Foxy Bingo. Betfair Bingo is a decent online bingo site with lots to offer, and if we focussed just on the bingo operation, we would say that lack that special something to make them stand out from the crowd. Luckily for them though, they have the rest of the Betfair sites to give them a bit of a boost, and with your one set of log in details, you can gamble on just about any event out there or enjoy literally hundreds of different games. Betfair is a quality operation, and they may not be the best site on the market, but they are far from being the worst. Betfair Bingo runs on the Virtue Fusion software and offers 75 and 90 ball bingo as well as a large number of slots, instant games and scratchards. You can enjoy all of these games online, or via your mobile phone or tablet, as long as you have an internet connection e.g. WiFi or 3G. In the bingo rooms you will find plenty of options, enabling you to customise the look of the game, these include a selection of dab colours, shapes and dauber styles. You have total control over all of the different sounds and graphics such as the caller and background sounds. In the chat room there are plenty of emoticons and acronyms, and you can even change the size of the font if you are having trouble reading what is going on. The software also includes an auto-buy feature which uses a series of slide bars to set the number of games you wish to take part in and how many tickets you want to purchase. Betfair Bingo hosts four free bingo games each Saturday in their 75 ball Helter Skelter room. These games take place between 12pm and 1pm and everyone has twelve cards to play and therefore an equal chance of winning one of the £30 jackpots. Every day you wager £1 at Betfair Bingo, you will earn a free Piggy Smash scratch card. Every player is guaranteed to be a winner, with prizes of 5p, 10p, 25p, £1, £2, £25 and £500 up for grabs. There is a schedule packed full of guaranteed cash jackpots at Betfair Bingo, but the highlights of the day are their Bingo Linx games. There are four of these games each day with over £10,000 to be won. Betfair Bingo is part of the Virtue Fusion network and offers the networks standard promotions. This is not always a bad thing though, as the network is one of the better ones out there. Each day they give away over £10,000 worth of guaranteed jackpots and they host free bingo games every Saturday. In addition to this though, they also have bargain bingo, BOGOF bingo, penny bingo, roll on bingo and plenty of chat games. On top of these regular promotions, you will usually find monthly specials such as Winning Weekends where they give away hundreds of thousands of pounds through three special bingo sessions spread over three days.